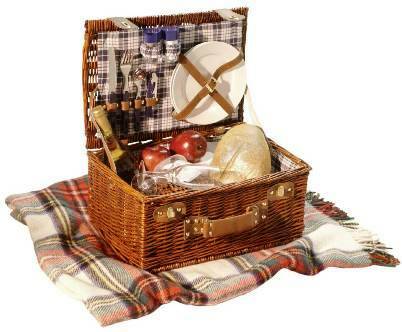 Today is National Picnic Day! Get out your baskets and blankets; grab a couple sandwiches, a bottle of wine or two and enjoy your meal outdoors! 1. an excursion or outing in which the participants carry food with them and share a meal in the open air. 3. Also called picnic ham, picnic shoulder. a section of pork shoulder, usually boned, smoked, and weighing 4–6 pounds. 4. Informal . an enjoyable experience or time, easy task, etc. : Being laid up in a hospital is no picnic. 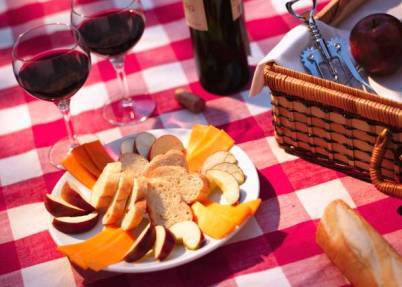 The word “picnic” can be traced back to the French book, Origines de la Langue Française printed in 1692, in which the term was used to describe a group of people dining in a restaurant drinking wine that they had brought with them. Soon the term came to mean a meal to which each person brought something – much like a potluck. In 1789, after the French Revolution, royal parks were opened to the public and picnics became a popular pastime. During the early 19th century, a group of people in the UK formed the Picnic Society and planned public picnic events in London. – The first official picnic tables (as we know them today) were built in the late 1800s. – In the year 2000, a 600-mile-long picnic took place from coast to coast in France, celebrating the first Bastille Day of the new Millennium. – It’s an Italian tradition to picnic the day after Easter, on “Easter Monday”, also called “Angel’s Monday” or “Pasquetta” (“Little Easter”). – A “picnic ham” is not actually ham; it’s cut from the foreleg of a pig, whereas true ham is cut from the hind leg. – Ants join your picnic in droves because once one has visited it leaves a scent as it returns to its nest, thus attracting the other ants to your food. The above fun facts were found on a website I stumbled upon all about picnics: Healthy Picnics, Healthy Recipes, Family Fun! Heat grill to high. Place lemon juice in a small saucepan and bring to boil on the grates of the grill. Cook until reduced to 1/2 cup. Remove from the grill and let cool slightly. Leave grill on high heat. Place lemon syrup, habanero, lemon zest, and mayonnaise in a blender and blend until smooth. Season with salt and pepper, to taste, and transfer to a large bowl. Add the onions, celery, and parsley and set aside. Brush tuna with oil and season with salt and pepper on both sides. Grill for 3 minutes per side or until slightly charred and cooked to medium doneness. Remove from the grill and let rest 5 minutes before cutting into small dice or flaking with a fork. Add the flaked tuna to the mayonnaise mixture and gently mix until combined. Divide the tuna salad among 4 slices of bread. Top the salad with a few sprigs of watercress and top with the remaining bread. Place the sugar in a heavy-bottomed saucepan and caramelize on high heat stirring constantly. It will turn amber brown in about 5 minutes. When it is a uniform caramel color, add the butter, and stir it in. Once mostly combined, add the chocolate, and stir to blend. Pour it out onto a silpat or parchment lined sheet pan, and spread it with an offset spatula 1/8-inch thick. Let cool and break into small pieces. Store in an airtight container. This entry was posted on Monday, April 23rd, 2012 at 2:40 PM	and is filed under Misc.. Both comments and pings are currently closed.